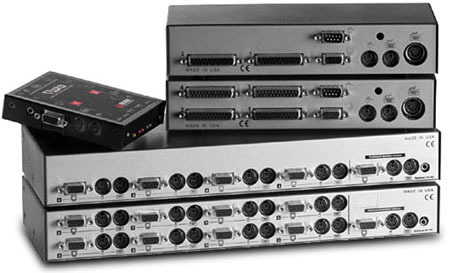 The Vista Native KVM switch has been specifically designed to be inexpensive, reliable and rackmountable. Ideal for any situation where a computer user needs to access up to eight different computers on a regular basis without changing their keyboard, monitor and mouse. A single keyboard, monitor and mouse can be used to control multiple computers without swapping cables. Through simple keyboard commands, via buttons on the Vista's front panel or via the On-Screen Display (on select models) users can easily access any attached computer. Models with On-Screen Display allow maximum flexibility in computer control. As with our entire kvm range, the Vista Native has robust keyboard and mouse emulation. Emulation simulates a keyboard and mouse synchronization signal to your computers, allowing simultaneous booting of all computers. Emulation ensures continuous computer operation without a direct connection to a keyboard or mouse. The Vista Native is operating system independent allowing for use on a wide variety of PC operating systems including DOS, Novell Netware, Windows 95/98/NT/2000 and Linux to name just a few. The Vista also supports a mixture of AT or PS/2 keyboards and a mixture of serial and PS/2 mice. Wheel mice are also supported.